the residence of the noble Bohemian family of Slavata. On 4 August 1306 in Olomouc, the Czech, Polish and also Hungarian King Václav III of the Premyslid dynasty was murdered. 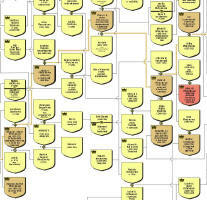 The killing ended the male line of one of the most important ruling houses in Central Europe. In Czech and Central European history, there are not too many documented historic events that would keep their magnitude even after 700 years. Thus, it is appropriate to use such anniversaries to recall the significant turns in history. With perspective, it is useful to try to look for a fresh interpretation of the historic facts and judgement of the repercussions. However, to get into the perspective, we have to go back 400 years further. Academics in the field of state and law list a number of essential preconditions for the constitution of a state and a nation associated with it (in the pre-Herder notion) from a more-or-less defined social group (clan, tribe, community). 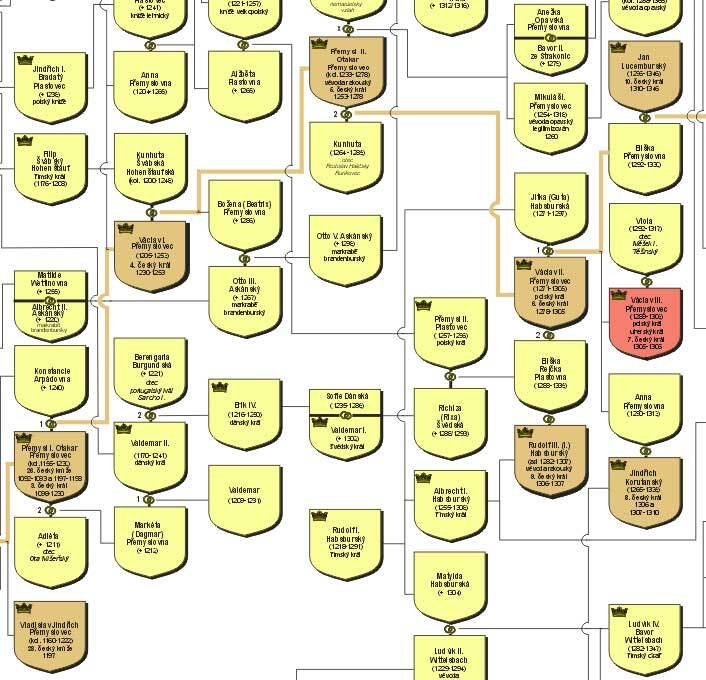 With respect to the subject, the role of the Premyslid dynasty in the Czech and Central European history, we are going to touch upon only two of them briefly. We are going to focus on the crucial steps necessary for the successful creation of the state-forming nation and for securing its continuous existence up to the present day: unification and Christianisation. The precondition for the creation of the infrastructure of governance in a reasonably extensive area was above all the unification of the inhabitants under one central authority. In particular, such unification was decisive for the formation of sufficient military power. For future success it was important that the powers of the individual tribes and clans were cumulated or even multiplied rather than being diminished in the ongoing tribal struggles. Apart from enhancing the defence abilities against a foreign enemy, the unification of the governing authority contributed to the creation of favourable environment for the founding stones of the economic prosperity of the unified territory, for the flourishing of production and trade. It was possible to progress to an introduction of a currency that could be effectively regulated. Then, speaking in modern terms, Christianisation facilitated the entry into the community of shared values. For the stabilization of the local environment, it was very important to adjust to the general, elsewhere already very common, philosophical and legal notion of governance. Without undue idealization, it is possible to say that for the new rulers the Augustinian Deo servire regnare est represented a constant challenge to tackle and to be tackled by. For the rulers and for their subjects, joining the South Eastern Christian Europe meant above all an enhanced legal security. Their personal and national security was strengthened by implementation of the established procedures for accepting authority, instruments for dispute resolution and by alliance-building tactics. Last but not least, a common ideological base for a joint defence (potentially attack) against an external enemy was being created. In Bohemia, both these important achievements were undoubtedly attained by the Premyslids, who ruled the Czech lands for more than 400 years. 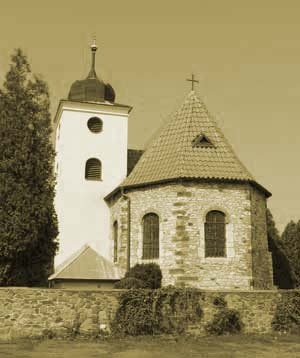 Christianity was accepted sometime in the 970s by the Přemyslid Prince Bořivoj (in German sources Gorivei) as then one of the leaders of the clans ruled by Svatopluk, the Prince of Great Moravia. But already his grandsons Václav (Wenceslas) and Boleslav successfully completed the unification of the population of the Bohemian basin. It is a well-known fact that the brothers did not agree on the method of government. Most probably in 929 or 935, the junior of the two brothers, the one with clearer political vision, Boleslav, solved the disagreement by a murder, or possibly an unfortunate killing, of his elder brother Václav. Then he very vigorously dealt with the opposition of some of the Bohemian clans and was able to establish a modus vivendi with the powerful German neighbours. Soon, he understood the importance of autonomy in belonging to the community of Christian nations and the universal church. Consequently, he pressed for the creation of an independent Bohemian bishopric. Quite successfully he combined his penitence for brother killing with the politically important agenda of Václav´s canonization. He involved other members of the family. He sent his daughter Mlada to Rome to obtain the relevant consents. He used matrimonial politics as well, by marrying his second daughter known as Doubravka to the Polish Prince Mieszko. Perhaps thanks to her influence, Mieszko became the first Christian ruler of Poland. Boleslav did not see the creation of the bishopric, it was his son Boleslav II who succeeded in 973. In the same year, his sister Mlada became the abbes of the oldest convent in Bohemia, the Benedictine convent of St George in Prague. In this way, Prince Boleslav I stands out in the Přemyslid and Czech history as a crucial individual - the founding father. Having stabilized the rule of Bohemia in their hands, the Premyslids set out for more ambitious goals. Gradual consolidation of the relations within the ruling house was confirmed by retreating from the principle of seniority, which was replaced by the recognition of primogeniture. The principle of seniority, where the eldest member of the clan took the place of the ruler, represented relations based on the eldest - supposedly - the most influential and powerful member of the clan becoming the leader. The principle of primogeniture, which settled the succession from the sovereign to his eldest son, is more based in the legitimacy of the ruling house, in the generally recognized legal claim to rule, rather than in military power or economic influence. Only rarely did the country magnates who were claiming the right to elect their sovereign dispute this principle. In no way, this means to imply that the Premyslids underestimated the need to back their legitimate claims to the throne by military and economic power. Vratislav II was the first of the Premyslids who achieved the royal title. He started his rule as a Bohemian Prince in 1061. 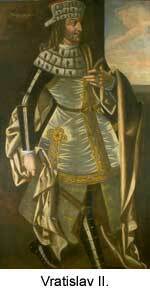 He became an important ally of Emperor Henry IV in his conflicts with the Saxon and Austrian Princes. Though, above all, he strongly supported him throughout the Investiture Controversy. In 1085, he was rewarded with a life title of King of Bohemia and he was relieved of his due tributes to the Empire. The hereditary title was later promised to his grandson Vladislav II, who joined Emperor Konrad III on the first crusade to Palestine in 1147. In the end, he was awarded only the life title for the participation in the imperial campaign against Milan in 1158. In his reign, the reformed orders of Premonstrate and Cistercian monks arrived in Bohemia, and the first priories of the Order of St John were created. 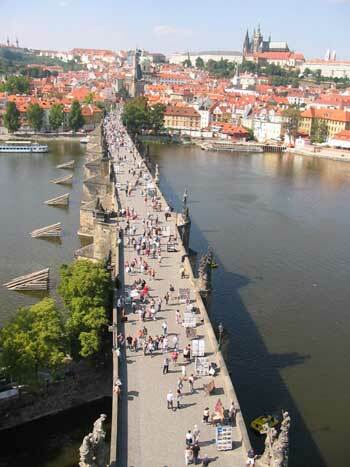 The predecessor of the famous Charles Bridge, which is still in place in Prague, was built in the times of Vladislav II and named after his wife Judita. In 1198, Vladislav’s son Přemysl Otakar I became the first hereditary King of Bohemia. His hereditary title was reconfirmed in writing in the Golden Bull of Sicily issued by Emperor Frederick II in 1212. 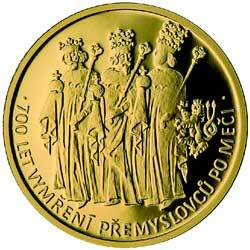 The first two hereditary kings, Přemysl Otakar I and Václav I, were by large kept busy trying to hold the territory. They had to face constant political games of the Roman Emperor and they had to contribute to the protection of Central Europe against the Tartar invasion. However, thanks to exceptionally smooth transfer of power from father to son, Václav could spend more time taking care of the prosperity of the country. At his court, he brought West European culture and education; he introduced the Gothic style in both sacral and secular architecture and he himself was an active contributor to the courtly art of the Minnesang (like his grandson Václav II). At the end of his reign, he had to face an uprising led by aristocrats who were trying to seat his son Přemysl Otakar II on the throne by using his ambitions. The uprising was defeated but represented a piece of valuable experience for both of the Premyslids. The reign of the house reached its climax in the personality of Václav’s son, Přemysl Otakar II. It is not without interest that in his most famous work Dante Alighieri makes a note of admiration of this great ruler.https://www.pozitivni-noviny.cz/gallery/image-archiv/IMAGES-2/rod1.jpg The Premyslids became an important royal house c ontrolling a kingdom spreading from the Giant Mountains cross Austrian lands to the Adriatic. The success was underpinned by both personal courage and military power and, of particular relevance, economic power. Already as a young prince, Přemysl had to defend the position he was elected to by Austrian nobles, then, as the King of Bohemia he led a mighty crusade to Prussia, reached the Baltic and founded Konigsberg. He kept on fighting Hungarian King Béla IV and his successors. Thanks to the weakened rule in German Empire, Přemysl became the most powerful ruler in the area. To his kingdom, he added Egerland, Carinthia and Carniola. He took over castles in Slovakia and by inviting German miners and craftsmen into newly founded towns made Scepusium an important part of his economic power. In this way, he only repeated what had proved to be a great success in Bohemia: by inviting settlers from the German Länder, he began to uplift unwelcoming borderlands. He used modern economic tools, tax relief in particular. He settled the newly established towns serving as a support against Czech noble houses by craftsmen and used experienced mining businessmen to open new gold and silver mines. As well, he had new legal acts introduced to improve the economic environment. At Provincial Court in Prague and in Moravia he had provincial registers established, to regulate mining rights, and he had drawn up the mining act Ius regale montanorum that was introduced later in the reign of his son. In the end, his military and economic power, which resulted in his denomination of the Iron and Gold King, concentrated pressure of the neighbouring rulers against the Kingdom of Bohemia. In vain, the King confronted it and, trying to resolve matters in the field, he fell in 1278 https://www.pozitivni-noviny.cz/1173-a.html - _ftn3. As his son Václav II was then only seven, his uncle Otto of Brandenburg governed as regent in his stead. The young king grew up in very difficult conditions, he was in fact his uncle´s hostage ‘sold’ to Czech nobles for a substantial ransom at the age of twelve. Furthermore, still young, his mother did not take her widowhood too seriously and lived with a prominent noble of the country Záviš of Falkenštejn, to whom she married in the end, in 1284. Through her, he exercised limited rule of the country, so it took the king further four years to muster power truly in his hands. It is of no surprise that the emancipation of the young king was not without fights and violence, which, in the end, claimed life of the ambitious Záviš. We will come back to this when discussing the circumstances of the Olomouc murder. Physically, Václav II was not as able a warrior as his father, though he was driven by the inherited ambition. Soon, he discovered the German Länder did not offer any future prospects, and thus he turned in the Eastern direction. To Bohemia, he annexed some of the Polish principalities, in particular, the ones with strong influence of the German aristocracy and patricians (Krakow, Sandomierz). After the death of the King of Poland in 1296, Polish nobility offered to Václav both hand of the royal daughter Elizabeth and the Polish crown. After three years of quarrels, he was crowned Polish King in 1300. Only a year later, the House of Árpád died out in the neighbouring Hungary and some of the Hungarian barons offered Václav the Hungarian Crown for his son. Even this offer was not without ambiguity, so when Vaclav II´s son was crowned as Ladislaus V of Hungary other part of the Hungarian nobility elected Charles Robert of Naples as a counter-king. What made Václav II appealing to the aristocracy in the surrounding countries to wish him for a king? As it has been stated, he was not a famous warrior. He was more of a skilful diplomat and above all a good custodian of his country. He relied on the wealth of his silver mines. He strengthened the economy by putting an end to merchant and customer rip-offs by coin swindles. He carried out an important coinage reform, the most visible result of which were heavy Prague groschen - grossi pragenses - rolling out of Bohemia throughout Europe. For coin minting, Václav invited to Kutná Hora mint entrepreneurs from Florence who founded the mint Italian Court, still in existence. He intended a number of other significant administrative measures, which were ahead of its time. His intention to introduce in the country a written legal code for which he invited to Prague a leading lawyer of the time Gozzius of Orvieto was wrecked by the nobility. As well, he made first steps towards founding the first university, Studium generale. Similarly, this intention, that could provide Central Europe with a university at the time of birth of the oldest British and Italian universities, was blocked due to fears of the excessive influence of the church. Like his father’s, Václav´s power caused malcontent in the neighbouring countries. Thoughtfully, Václav ‘cut short the front’ by retreating from Hungary while taking away not only his son but Hungarian crown jewels as well. In 1304, he defeated attacks on Czech lands but he did not rejoice of the success for long. Due to total physical exhaustion, he died the next year, aged 34. Despite that fact, as he gave the country 20 years of good reign, he entered Czech history as one of the most important rulers. The overview of the Přemyslid rulers must be complemented by at least a brief mention about the significant female representatives of the dynasty. Apart from able rulers, the family gave a number of remarkable women. We have already mentioned some of them. In the early period, it was Princess Doubravka, daughter of the Czech Consolidator Boleslav I. Not only did she contribute to Christianisation of Poland through her husband Mieszko, but also she bore him the future Polish King Boleslaw the Brave. We as well have remembered the royal daughter Abbess Mlada, who travelled to Rome on a diplomatic mission and negotiated the creation of the Prague bishopric with the Pope. 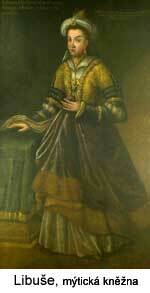 However, the most prominent figure is Anežka (Agnes), the youngest daughter of Přemysl Otakar I. Since her childhood, her father had tried to incorporate her into his marriage policy. Perhaps as a three-year-old she was engaged to a Polish royal son Konrad, who died though. Then, an engagement to the nine-year-old son of Henry II followed, but was abandoned due to scheming. 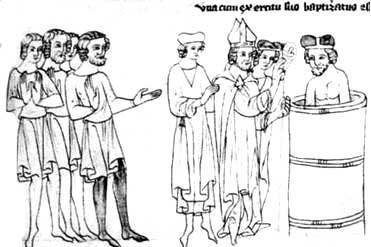 In 1226, a delegation from England arrived in Prague asking Anežka’s hand for the King Henri III Angevin. However, he called off the engagement three years later. As Anežka spent long years in convent education, after her father’s death, she persuaded his successor, her brother, not to oppose her decision to follow a monastic career. As a royal daughter she became an abbess of the St Francis Convent. This learned woman was in correspondence contact with St Clare, the founder of the female branch of the Order of St Francis of Assisi. She gained influence in Czech politics, in particular in the uneasy times of quarrels between her brother Václav I and his son, the ambitious Přemysl Otakar II. She died considered saint and was soon beatified. However, she was sanctified only at the end of the twentieth century. Přemysl’s second daughter entered European history too. She became wife to Danish King Valdemar II and for her beauty she earned the flattering Danish name Dagmar (Morning Star). She was very popular among the people and still belongs to the remembered Danish queens. She gave birth to the future King Valdemar III and died in 1213 giving birth to another son. Last but not least, it is appropriate to include in the list Václav III´s sister Eliška. This remarkable young lady played an important political role in the chaos that spread in Bohemia after Václav III’s murder. In agreement with church and secular representatives of the kingdom, she confronted the interests of her elder sister Anna who was married to the ruling but incapable Henry of Carinthia. She agreed to marry the son of Emperor Henry VII of Luxembourg, and so her husband John of Luxembourg became King of Bohemia in 1310. Although life with this adventurer, who turned to be one of the most celebrated warrior of the Hundred Years´ War, was in no way and easy one, Eliška became an important bridge across which the line of the extinct Přemyslid kings passed over to a new splendid Luxembourg dynasty. 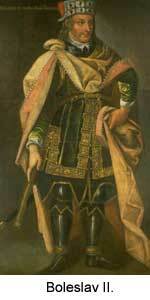 Eliška was mother of the greatest Czech King and Roman Emperor, Charles IV. Finally, let us look at the background to Václav’s murder. Thanks to chroniclers of the period we know fairly precisely what happened. In the early time of his reign, a young king Václav III set out on a campaign against the rebellious Polish Prince Władisław the Elbow-high, who had perfidiously broken the peaceful settlement and attacked the Czech garrison in Krakow. The king had probably decided for Olomouc to be the rallying location for the country´s forces and was waiting for the army to gather. He lodged at the Olomouc castle in the Dean Budislav´s house. In the afternoon that day, he was in the palace, presumably looking for rest and solace from the summer´s heat. As the contemporary chronicler Petr Žitavský put it, ‘Clad in shirt and cloak, he was alone in the palace’. There, the murderer found him unarmed and unprotected by his guards and killed him with three stabs. Then, when - rather illogically - a man with a bloodstained knife ran out of the palace, he caught attention of the guards stationed outside and was killed on the spot. It seems very improbable that this man was the murderer. The chroniclers recorded his name as Konrad of Mulhow or Konrad of Botenštejn. However, Thuringian sources state that Conrad of Mühlhausen (Mulhow in Slavic version) in residence at the castle Bottenstein, a Thuringian mercenary and hireling, died fourteen years later. Obviously, he was not the man the guards killed. Neither the contemporaries, nor the later chroniclers and scholars have been able to supply any reliable answers to the crucial questions: who killed and why. Undoubtedly, it is significant to find out the name of the killer, though more only as an indication leading to evaluating the possible wider political and power implications of the assassination. Speculations on whether and which powerful personality ordered or orchestrated the murder have always been more important. Contemporary chroniclers active in Bohemia expressed uncertainty and wondered that the culprit had not been identified. With its anti-German bias, the Chronicle of so-called Dalimil identifies the Thuringian as the murderer and Václav´s rival Emperor Albrecht as the plotter. Nevertheless, even this chronicler says: ‘More could be said about the disloyal ones here, though I leave the judgement to God’. And, at a different place, he repeats: ‘And if there were plot agreed, God would not hide the names from us.’ Ten years after the murder, the author of the Zbraslav Chronicle remarks wondering: ‘We are all astonished that until today, ten years after the murder, the culprit of this most shameful act is not known.’ It seems that all who were in time and space closest to the event cannot speak with certainty. Chroniclers in the neighbouring countries are quite clear; they always make sure any suspicion related to their masters is eliminated. So, the Krzeszów Annals state that ‘his own treacherous Czechs’ murdered the King. The same thing says the unusually well informed chronicler Ottokar of Styria. In his Chronicle he accounts with abundant though not very credible detail how Czech lords drew lots for who the murderer would be. The panic was supposed to be caused by king´s unexpected intentions for revendication – for the benefit of the Crown, he intended to expropriate possessions that had been lured from him in the early months of his reign. Similarly, the suggestion that his own gentry killed Václav is supported by chronicles of the Austrian monasteries (Heiligenkreuz or Annales Osterhovenses. Other Polish source Holy Cross Annals indicate that Václav was killed by his own Austrian courtier. The reluctance of the Czech chroniclers suggests that the theory of the local aristocratic conspiracy may well be plausible, as the culprits would be chroniclers´ contemporaries and most probably kept their influence. Neither the scholars who asked the question cui bono? could get anywhere. The list of beneficiaries from Václav’s death is by no means short. It includes Emperor Albrecht Habsburg, whose son Rudolf indeed did – though very shortly – hold the Czech Crown. Similarly, the south-eastern neighbour Charles Robert of Anjou, who could not secure confirmation of his right to the Hungarian crown, had a good reason. And obviously, the Polish Prince Władisław the Elbow-high, who made Václav to set on his campaign, was very much relieved. Apart from this, speculations arose that ladies could have been involved. In particular, Václav’s wife Viola of Cieszyn was afraid of being repudiated. Though, there are good arguments against as well as for all these theories. For example, Václav had handed over the Hungarian crown jewels to Albrecht letting him to sort out his pretensions to the Hungarian throne with the House of Anjou. To a large extent, in this way, Václav dealt with his relations with the Empire and no conflict could have been looming from this direction. What was Václav III like? What can we say to characterize the victim? When considering the causes for the murder, can we find out more by learning about his personality? Was it a political assassination or a private act of violence or vengeance? As the last legitimate male heir of the Přemyslid dynasty, he succeeded to the throne immediately after his father’s death in June 1305. 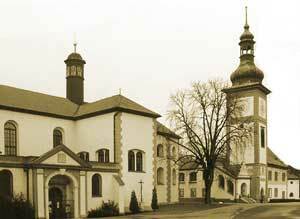 Václav’s reign was in its final stages well managed, supported by accomplished counsellors; and spiritually, it was based on the spirituality of the Cistercians represented by the Zbraslav monastery. The change that came with his son was denominated by the contemporaries as ‘a wild reign’. Since the first moments Czech aristocracy unwilling to allow the monks and German gentry to have influence on the king any further surrounded the sixteen-year-old king. The chroniclers in general agree that the aristocratic families sent their sons to court to join the king´s train that encouraged entertainment usual for a noble of his age rather than government. Contemporary reports describe in detail how the young king ‘got drunk on wine and spent sleepless nights in drinking bouts’ and how ‘bad and perverted his morals were’. The Ottokar of Styria´s rhyming chronicle states as well that he drank too much and spent nights with strumpets and then drunk and tired gave away generously the royal properties to his minions. Likewise the Zbraslav Chronicle confirms that Czech lords ‘not rarely, acquired royal privileges in state of drunkenness’. It is interesting and to a certain extent self explanatory that the chronicler Dalimil, who otherwise offers abundant descriptions of the individual rulers, says nothing about Václav. Probably, the recollections of his doings were in Dalimil’s times – ten years after the young king´s death – still too vivid. However, in a year, a change comes. The Zbraslav Chronicle claims it to be the result of a serious conversation between the young king and the abbot of the Zbraslav Monastery on the anniversary of his father´s death. Maybe, the fact that the young king got married in autumn 1305 played some role in it. And, most probably, real problems like maintaining power in Poland started to show up. After he found out that for financial reasons he could not think of gathering a mercenary army and his request to the Czech gentry to support him in his war against the Elbow-high met with a reluctant response, he turned against them. He began to prepare steps to regain properties he had been giving away so foolishly. This was considered one of the possible motives for Václav III to be eliminated. However, there is another less greedy a motive. A chronicler writing 40 years later, a historian at the court of Charles IV, Beneš Krabice of Weitmile, suggests more. Understanding better the consequences, he sees the developments from perspective He accuses the highest dignitaries of the kingdom, the High Steward, the High Chamberlain and the Marshall, that they neglected their duties and thus compromised king´s personal security as well as his interests. If we look at who Krabice accuses of negligence or malintent, we can see that they were the members of the group of the highest Czech aristocracy who had already complicated life to his father Václav II. In 1284, these lords were made to respect the country’s peaceful settlement, curbing their wantonness at the time when the young king was getting grip on power. 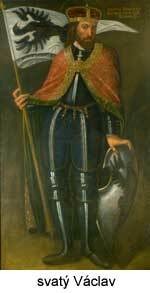 Several years later, the king’s side imprisoned the leader of this group, Záviš of Falkenštejn. A war broke out between the king and the powerful family of Vítkovec, member of which Záviš was. During the war, in 1290, Záviš was executed; some of the members of the family fled abroad and the rest were subdued. Despite this, as we learn, their supporters still held the highest offices in the country even after Václav III´s accession. So the chronicler Krabice suggests, it could have been an act of revenge for the defeat of the Vítkovec family and Falkenštejn’s death. However, even this version could be questioned for a number of reasons. Why did they wait for 15 years to carry out the revenge? Did they not dare attack their original conqueror? And last but not least, was such revenge worth the risks and chaos related to the extinction of a hundreds-of-years-old ruling dynasty? Was it meant to facilitate the rise of a new Czech dynasty? The developments after Václav’s murder do not support this in the least. Thus, both the motif and the people behind the murder remains and most probably will remain undiscovered in the dark. What does the 700th anniversary of the Olomouc murder mean to us today? Do the Premyslids and their rule still have anything to say to today’s Czechs or other Central Europeans? Obviously, the role of the Premyslid dynasty in the formation of the modern Czech statehood in the 19th and 20th century can only be secondary. It is the role that has been played by the image of the times represented by the reign of this dynasty, which has existed in the minds of the ones interested in state and statehood. It is given by the extent to which the Premyslids have been a part of the continuous Czech historic consciousness. In this respect, the perception of the era of enlightenment and the beginning of the 19th century largely differs from the perceptions of the break of the 20th and 21st century. In the first half of the 19th century, the first thorough narrator of the continuous Czech history František Palacký does not give the Premyslids any particular credit. They do not fit into his enlightened and nationalistic interpretation of Czech history. With his classicist admiration for Classical democracy, ‘the ancient tales of the elders’ about the prehistoric Slavic democracy, including the Slavic state, appear very much appealing. Unification of Czech tribes and creation a modern state structure of West European type is no news and thus no credit needs to be given. And to cap it all, the reigns of the Premyslid kings, in particular the one of Přemysl Otakar II, of Hohenstaufen origin from his mother’s side, opened the gates to the German colonization of the Czech lands. Furthermore, feudalism arrived with him; the hereditary rights to land ownership were reinforced at the expense of the free squires. Neither the spiritual quality of the great Premyslids fit in line with the traditions of reformation and enlightenment. However, the end of the 19th century brought forth the rise of critical methods in history. Above all, the forgery of the so called manuscripts of the early Slavic era was uncovered. The manuscripts were supposed to be proof of the ancient pre-Premyslid democracy. Moreover, the perception was asserted of the significance of the period from the 11th till the 13th century, when it was being decided whether the Central European area would belong to the nascent European civilization. By unifying and accepting Christianity, the local tribes became part of the Latin Europe, whose borders thus moved farther to the East. With reason, in relation to the individual Premyslids, we have stressed their interests in foundation of free towns, in respect for the aristocratic freedoms, in their intention to increase legal security and in foundation of a free university. Even according to current European historians, this is the era marking the beginning of the ‘long Middle Ages’. However, even in the 20th century, Palacký´s interpretation of Czech history has not lost its appeal. Tomáš Masaryk followed it up when formulating the fundamental ideals of the independent Czech state. Kamil Krofta, a historian and a pre-war Czechoslovak minister of foreign affairs developed it further. And even the communists favoured him, as he fit in well by his lack of emphasis on the Czech appurtenance to the West and by his nationalistic and anti-Catholic stance. They as well enjoyed the fact that tradition of St Václav and of the other Premyslids distorted by the views of the historians of the so-called Goll´s school was abused by the collaborationist institutions during the Nazi occupation. Hence, it is of no surprise the Premyslids became a true “idol” of Czech history only in the last 15 years of the free-living of Czech society. As Dušan Třeštík, a leading Czech medievalist, puts it, in the mind of Czech public, the Premyslids have been granted the place of the so needed myth of the founding fathers. This myth is very important and maybe even more important in the unifying Europe of today. And possibly, if I may propose with a smile, even the patron saint of the Czech lands Anežka of the Premyslids could have contributed to this unexpectedly modern image. Her sanctification in 1989 was a reason for the largest non-Communist gathering in Czech lands. It took place only several weeks before the velvet fall of communism in November 1989. However, let this bold statement be argued in a separate study. < náhledy archaizujících barokních pláten ze státního zámku Horšovský Týn poskytl Národní památkový ústav. Tento článek byl v Pozitivních novinách poprvé publikován 18. 11. 2006.